This little pooch is a neighborhood friend of Canadian watercolor artist, Diane Michelin, from the Vancouver Island coast of British Columbia. Diane says whenever she is outside and this dog comes around he walks over and sets on her feet. 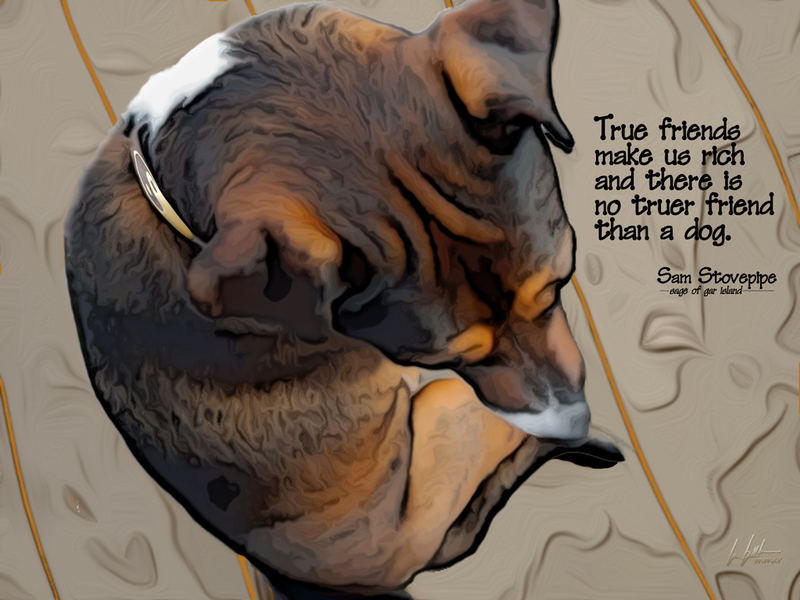 So she took a photo of him – from above; posted it to Facebook and I took that image as inspiration for this image and added a bit of Sam Stovepipe, Sage of Gar Island wisdom, to make this eLITHOGRAPH titled, ‘Dog Porch: Zen Friends”. I have been busy with new pieces, collaborating with more people and bringing a new level of technique to the eLITHOGRAPH process. Following are few of the pieces I have been working on … and Kudos ‘n Thank You’s to those who graciously allowed me to continue the rending of influence initiated by their infusions of creativity.